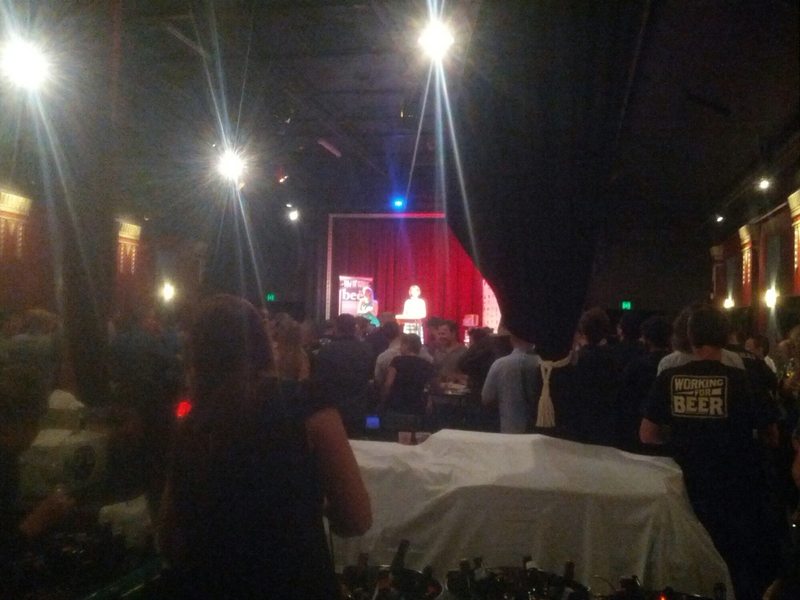 A stunningly crap photo I took at the Craft Beer Awards. Forgive me, I was too busy drinking weird beers. Thing #2: Award nights are great for weird beers. At least the Craft Beer Industry Association’s awards are. I was pleasantly surprised to be invited to attend, and spent days trying to work out what I was supposed to wear. Because, hey, you don’t want to turn up wearing jeans and a T-shirt and find out everyone else is wearing suits. I even went to the stage of Googling ‘‘neat casual’’ to try and figure it out – in case it said ‘‘trackpants are okay’’. Yeah, I needed this sort of help because I’m far from stylish. Often my fashion sense can be described as ‘‘rumpled’’ or ‘‘covered with glue and fired from a cannon through a clothing store’’. If you’re wondering, trackpants aren’t okay. I opted for jeans, collared shirt and new shoes, because I read somewhere new shoes were important. And once I got there I realised there were a number of people who hadn’t even bothered to Google ‘‘neat casual’’. Or maybe it’s that brewers have a lower standard than most – as one explained to me on the night, ‘‘neat casual’’ means ‘‘pants’’. There’s a dress code I can get behind. The do was a casual stand-up affair with a huge array of the beers that had been judged sitting in plastic buckets full of ice. You fished through them until you found something you liked, handed it to one of the staff behind the bucket table to open and then poured some in your glass. It was like the best lucky dip ever. According to Untappd, I racked up 10 different beers – though I know the count was much higher than that because I didn’t go complete geek and check in everything. Among the 10 was a collab from Edge and Stillwater that I had no idea existed and a few beers from Cape Bouvard, which is an entire brewery I had no idea existed. Modus Operandi’s Zoo Feeder was good – and I got to the can before it was announced as champion IPA. I’m sure it disappeared soon afterwards. Two other big ticks were for the Newstead Brewing Company’s IPA and amber ales, the latter was one I didn’t check in but it was so good I still remembered drinking it. And it makes me keen to visit the brewery during my Brisbane holiday next year.